Whether you are a first-time property buyer or an experienced owner, buying a real estate property in India is not an easy task. It requires good amount of homework from your side and you need to verify a lot of important property documents. While requirements may vary depending on your state, there are a few general and important documents that you’ll definitely need to make a property purchase decision. Verifying the title of the seller is a very important and first task in your search for a property. Title is the legal way of saying you own a right to something. 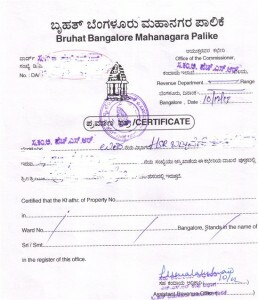 For real estate purposes, Title refers to ownership of the property, meaning that you have the rights to use that property. Deeds, on the other hand, are actually the legal documents that transfer title from one person to another. 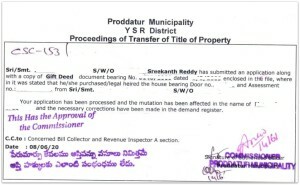 If you are planning to buy a property from a seller who inherited this property from his parents then you need to check for ‘entries in Revenue records’ (local civic body offices like municipality, panchayat or corporation) and predecessor’s title. In case, the seller had purchased the property from a previous owner then you need to verify the Title through a Sale deed. In case, the current owner has received the property as a gift from his parents then you can ask for a Gift Deed. If there were multiple transactions happened on the concerned property then you need to check all the Link Deeds and Mother Deed as well. Mother Deed, otherwise known as parent document, acts as the main document for proving ownership of the property. For tracing the ownership of a property, you need to begin the process with inspection of the earliest document i.e., Mother deed and then all the link deeds till the latest Sale deed (which is in the name of current seller/owner). One of the important property documents that you need to apply and verify is ‘Encumbrance Certificate’ or popularly known as the EC. The dictionary meaning of the word encumbrance is, ‘a claim on property or assets’ or ‘a mortgage’. An encumbrance is a legal claim on a property that affects the owner’s ability to transfer the ownership of the property. Encumbrance means whether the properties have any lien on them, whether attached by the court, whether mortgaged or sold etc. by the owner of the said properties. Encumbrance Certificate can be obtained from the sub-registrar’s office where the deed has been registered. (In some of the States an EC can be obtained online too). It is advisable to apply for Encumbrance Certificate from date of purchase till date. If there are multiple transactions done, all of them will be inter-linked in the Registration Dept’s database. 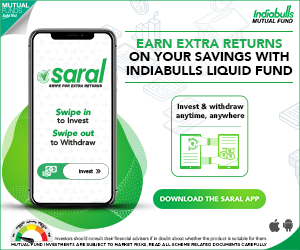 For example– the first transaction has a Registered document number as 44/1984 and the same is linked to the second transaction (Gift settlement). So, if you see these kind of links in your EC, you can request for the copies of all Link Documents (including the Mother Deed) from your Seller/Builder. In this way, you can establish the continuity of parent documents with child documents. An encumbrance certificate is important not only while buying a property but also when you are applying for a home loan or going in for a loan against the property. In case of Agricultural lands, mutation is must. Without mutation, the land title will not pass to the new owner. Mutation should be entered in the revenue records. 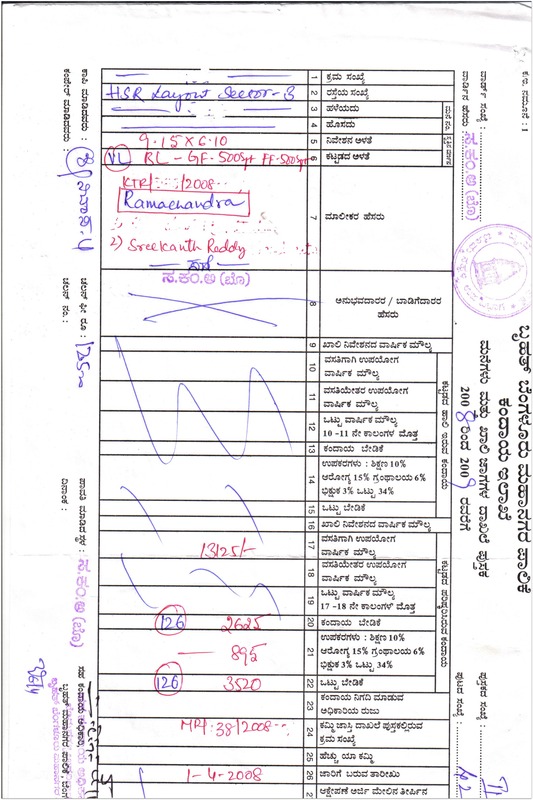 The owner’s name which is recorded in the revenue records is referred as ‘Pattadhar’. 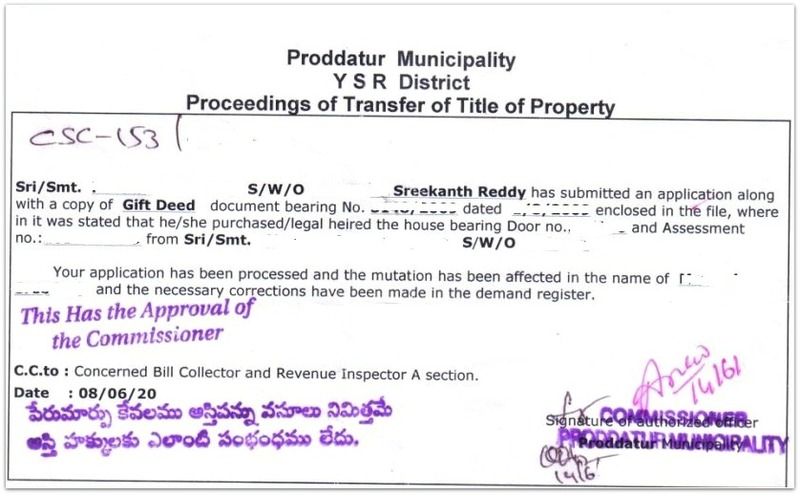 Below is a sample Mutation certificate issued by a local municipality in Andhra Pradesh. If you would like to check if a property has free title/ownership (or) whether it is mortgaged or not, you have to apply for Encumbrance Certificate. You can also cross-check these ownership details by taking a Mutation Extract. Once your name is updated in the revenue records, you may apply for Patta extract or Khata Extract or mutation extract to verify the details. 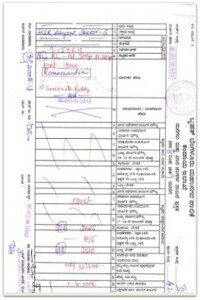 Below is a sample Khata or Mutation Extract (of a property located in Bengaluru, Karnataka). If the property has been mutated and recorded in the local revenue records then the current owner might be paying applicable property taxes, betterment charges etc., to the local civic body (municipality/panchayat/corporation). You can request for the last paid Tax receipt from the seller. Kindly make sure that there are no arrears and all tax dues (if any) till date of registration are cleared. If you are buying a property (plot/flat/home) in a layout, you can ask for a copy of approved layout plan of the entire project. One of my friends has recently bought a vacant residential plot in a layout. He later came to know that this plot has been ear-marked for an open space (park) as per the layout plan. He has been requesting the builder to cancel the registration and refund the monies. So, it is very important for you to check the entire layout map before buying a property. Most of the properties in densely populated areas and in prime locations have become unaffordable to buy. Hence, we see that many real estate ventures come up in sub-urban areas. In most of these cases, the builders buy agricultural lands and then convert them into residential or commercial layouts. Kindly note that the property owner must obtain legal permission or conversion order to change the use of land from agriculture to non-agriculture purpose. Besides the conversion order, the builder should have got approval from the local competent authority as well. For example : Any layout on the outskirts of Bangalore requires the approval of Bangalore Metropolitan Regional Development Authority (BMRDA). In case you are buying an under-construction flat or home, you need to check whether there is any building sanction plan or not. If it is available then it should have the seal /approval of local sanctioning authority (for ex: municipality office). If the building construction is completed as per the building approval plan and if it also meets other building standards like distance from road, height of the building, if rain water harvesting system is in place etc., the civic authorities will issue CC (in case of Apartments). When there are blocks or phases of large projects to be developed with varying completion dates, the concerned authority can grant a partial occupancy certificate for the completed phases/blocks. After the completion of entire project, Partial OCs are replaced by final OC (Consolidated document). Do note that it can be a tough task to get a home loan with a Partial OC. My personal suggestion is not to buy a flat which does not have an occupancy certificate. Pahani (RTC) is a very important revenue record, as it contains details of land such as owners’ details, area, assessment, water rate, soil type, nature of possession of the Land, Liabilities, Tenancy and Crops grown, etc. RTC stands for Record of Rights, Tenancy and Crops (RTC). RR stands for Record of rights. Issued by Asst. Tahsildar, RR or Record of Rights contains the details of the property, owners of the property along with the nature of the possession (acquisition of land). IL stands for Index of Land. It contains details regarding the owners of the land and details about the land. I have tried to list down the most important documents that you need to check when buying a property. The below list is based on the type of the property (Vacant plot/Flat/House). Check the antecedents of the Seller(s) : We all verify title deeds and all connected documents before buying the property. But we fail to verify the antecedents of the Seller. It is better to verify the character and antecedents of the owner beforehand. If the seller(s) are habitual offenders and involved in the real-estate offences or other crimes, then it is better to drop the idea of buying the property from them not withstanding whether the title is perfect or not. If the seller has good background and his character and reputation are unquestionable, then the transaction will be very smooth. Property Inspection & Land surveying : Buyer beware is the golden mantra in the immovable property transactions. Therefore, the entire onus lies on the purchaser in verifying the title, ownership and possession of the property. You must take all reasonable steps to ensure that you are purchasing the property from a right person and also a right property. The most important precaution is undertaking a personal inspection of the property under the sale. You can inquire with the property neighbors (if available) regarding the ownership of the property, any disputes etc., You can also take the help of a local land surveyor to know the exact boundaries of the property. Ancestral/ Inherited Property : You need to be extra cautious if you are buying an ancestral property. You can ask for ‘Family Tree’ certificate issued by the revenue authorities from the seller. Request for Death certificate of previous owner(s) in case of inherited properties. Documents from Society/Housing Boards : In case, you are buying a property allotted by a Housing board/society (or) by a Development Authority then you can request for the Allotment Letter and NOCs from the concerned Society regarding ‘no dues’ and ‘transfer of share in the property’. Mortgaged Property : If the property has been mortgaged or there is a loan on it then the Seller has to arrange for the Release Deed (if loan is repaid) or NoC from the concerned bank/lender. Minor as Seller : In order to sell property where the minor has a right, the seller (Minor’s guarding/parent) must seek permission of the court. Without such approval the sale can be challenged by the minor after becoming a major. Online Facilities : Most of the State Registration Departments are now offering online provisions where-in the citizens can apply and get the basic and most important property documents (like EC, Certified Copy of Deed, Search Report etc.,) online. In case, you are buying a large piece of land (especially in the outskirts of a city/town/village), kindly check with the local civic authorities whether the property in question is in Green belt (based on Zonal regulation map or CDP – City/town Development Plan). 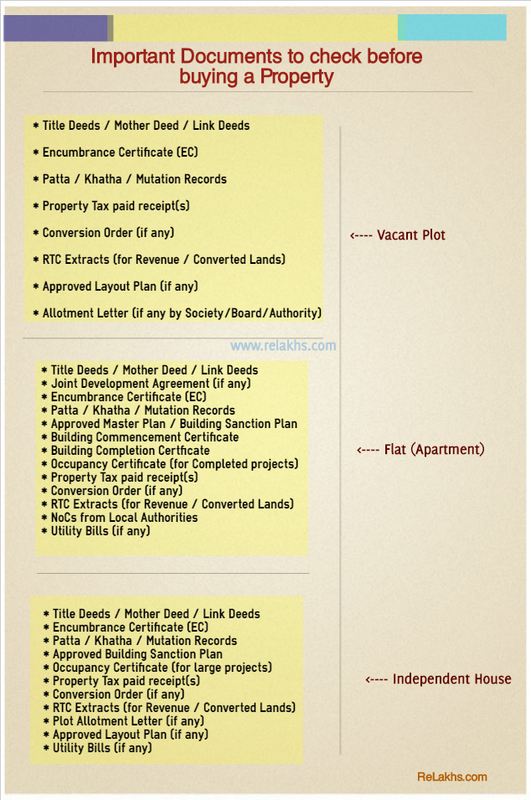 Also, check whether the property is not reserved/assigned for any specific caste(s). 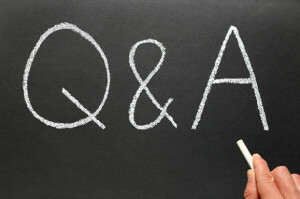 Last but not the least, hire a good legal consultant / Lawyer and get their legal opinion on the property. A very useful writeup. Succinctly summed up. 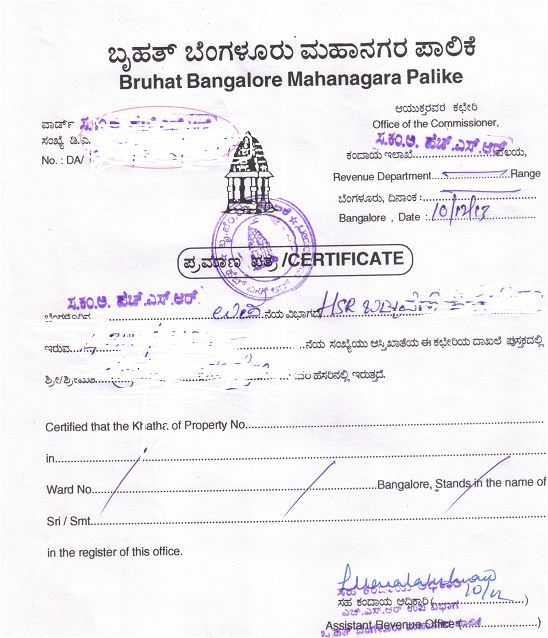 HI, I’m buying a Flat at DS-MAX Sangam [Seegahalli Bangalore] from the land owners share. It’s under Panchayat Khata & NO OC/CC. I’m interested as that falls under my budget. The LAND OWNER had gifted this flat to his younger brother… So the E-KHATA is in the name of the land owner and not the present owner. So can I buy it or not ? & would I get a loan from the bank ?? You may kindly request the Land owner to do the Khatha transfer on to this brother’s name. You may then apply for the loan and your banker will also do the due diligence check.. Thanks a ton for your reply Sreekanth. The owner isn’t agreeing to get the khata in his name. As that would cost him money. By the way I found out that it’s 11B Panchayat Khata. Can you cofirm if I can transfer the khata in my name without any issues once the registration is completed ?? As presently we have got khata in the name of the landowner & would I be able to transfer in my name ?? If yes how much would it cost me?? You may have to apply for e-Khatha in case of Panchayat limit properties..
My suggestion would be ask him to transfer it to his brother’s name first.. Thank you so much very well documented which a lay man understands. Thank you dear Kiran..! Keep visiting Relakhs.. The maximum tax benefit you can claim is Rs 2 lakh u/s 24 towards interest payment and up to Rs 1.5 lakh u/s 80c. Thank you dear Shakeel, keep visiting ReLakhs ! very well written and very well explained blog. Really needed it.